In the early days, the vacation rental market was quite different. There was no Internet to browse property listings on or social media channels to read guest reviews. Steve had a telephone, some black and white brochures printed by a friend, and some classified newspaper ads; but the phone started ringing, people started booking, and families started coming back year-after-year. In fact, one family, the Alderson’s, have vacationed with Harris Properties Management for the last 30 years, since 1983. The family started with just one home, now with 4 children, 10 grand-children, and 5 great-grandchildren, they need a little more room. And, they aren’t the only ones who choose the company’s boutique rental management philosophy. Each year, hundreds of families discover the one-on-one personal interaction offered at Harris Properties Management, and many of them consider this to be their perfect spot in the sand, and come back year after year.In 1983 Steve and Becky Harris put their two sons’ college funds on the line, ironically, in order to invest it in their futures. The couple had searched literally from Mexico Beach, FL to Dauphin Island, AL and had finally found their perfect spot in the sand. In that year, they purchased Catalina, a quaint Fort Morgan beach cottage, with plans to rent it to vacationers. Then they spent the next five hours driving back to Birmingham nervously trying to convince themselves that they had done the right thing. During the years following, the Harris family acquired additional Fort Morgan and Gulf Shores beach cottages to add to their investment portfolio. In 2003, the family was forced to change its business strategy for a time. Steve fell ill with cancer. And after a difficult struggle he passed away in January of 2004. The family hired outside management companies to take on the company’s day-to-day operations. “That was a dark time in both our family’s and our company’s history. Mom did a great job holding things together and so did the management companies that we worked with. Without their efforts we may not have made it through that time, I may not be doing what I am doing now.” But in 2010, in the midst of the oil spill, the family decided to go back to its roots and run the properties as owner operators once again. Gulf Shores, Orange Beach, Fort Morgan and Perdido Key. We offer a unique "boutique-style" rental service. We are not in the vacation rental business, we are in the memory making business. Our main concern here at Harris Properties is that you and your family have the best vacation possible. We are locally owned an operated and if you need anything we are right here to make sure you get taken care of. We treat each of our guests as if we were personally hosting them ourselves and that is what sets Harris Properties apart from other Rental companies. If you are looking to cool off, head on over to Waterville our local water park. If you are in the mood for some friendly competition, have a go-kart race at The Track or head over to Fat Daddy's Arcade for some gaming. Hop on your bike and explore the trails at the Gulf State Park or spend your day shopping at the Tanger Outlets. There is something for everyone here! Loved our family trip to the Brainstopper. We had over 18 for a week in summer 2015. We cooked every night and loved our stay. The kitchen is fantastic with two dishwashers and plenty of dishes for a group of 18plus. We are repeaters and hope to visit again in 2016. We would love to see a big flat screen tv on the main level. Such a big house and one small flat screen in a tv armoire is too small for the main living area. Other than that, the house is well appointed for a large group. We enjoyed every minute of our stay at Salt Life! The house is beautiful and the perfect location! We had 11 of us in our group and everyone had a comfortable place to sleep. There were plenty of places to get away and relax if you needed some quiet time alone. We are already looking forward to our stay next summer! My family and I thoroughly enjoyed our stay and will definitely visit again. If you were here we would hug you! 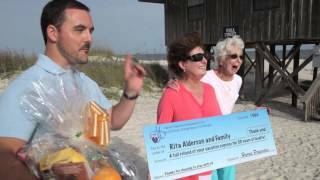 After 30 years of vacationing with Harris Properties, Rita Alderson received an unexpected gift! This is what makes HPM different! Rita Alderson has been staying with Harris Properties in Gulf Shores and Fort Morgan for over 30 years! See how that loyalty pays off! Do you want a free vacation?? Watch the video to see how! !